Fri 04 / Zwervende tentoonstelling #15@Koetshuis – 100 x 100. Only open Saturday 5 and Sunday 6 from 2 - 6 pm. In this Augmented Reality Expert Meeting we bring together artists, developers and theorists to discuss what AR brings as a medium. The meeting is open to invited guests only. If you want to be part of this discussion, contact Jan Misker via ar-ecosystem@v2.nl Please indicate your area of expertise, as we aim for a balanced mix of professionals. Fri 04 / De Zwarte Ruyter - Johan Thom and Hand Wilschut. A lecture series by Jan Verwoert. 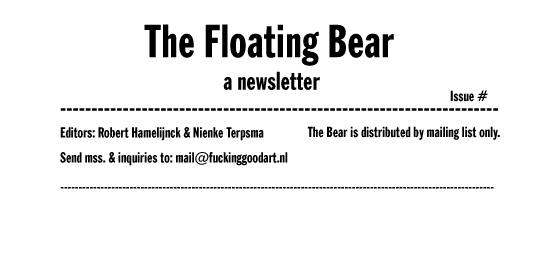 Fri 11 / Sculpture International R'dam. Wed 16 / WORM – We Are Fine: Thai shorts. Thu 17 - Sun 20 / Route du Nord 7th edition. Fri 18 - Sun 20 / Witte de With - Act IX Let Us Compare Mythologies. A three-day cycle of staged events presenting international artists exploring the nature of the performance. Curated by Renske Janssen and Dorothea Jendricke. Sat 19 / HalfJuni - New Zealand artists Raised By Wolves present a new work, Chasing Losses. Raised by Wolves are Amy Howden Chapman (Los Angeles) and Biddy Livesey (Rotterdam). Chasing Losses is a new performance using a series of banners and actions to present a narrative about color as color, and the colors, patterns and psychology of the recent financial crisis. This performance is timed to fit between events forming part of the Witte de With Performance Cycle. Food will be served. An alternative genealogy of avant-garde film. Mon 21 / Wallgallery - Summer of Love. First Wallgallery groupshow with Hester Scheurwater, Barbara Witteveen, Michel Wieggers, Saminte Ekeland, Sophie Krier, Lidy Jacobs, Karin Arink, Nel Pak, and you.